Entangled photon pairs, termed as biphotons, have been the benchmark tool for experimental quantum optics. The quantum-network protocols based on photon-atom interfaces have stimulated a great demand for single photons with bandwidth comparable to or narrower than the atomic natural linewidth. In the past decade, laser-cooled atoms have often been used for producing such biphotons, but the apparatus is too large and complicated for engineering. Their findings were published in Nature Communications on Sep 23, 2016 (doi:10.1038/ncomms12783). 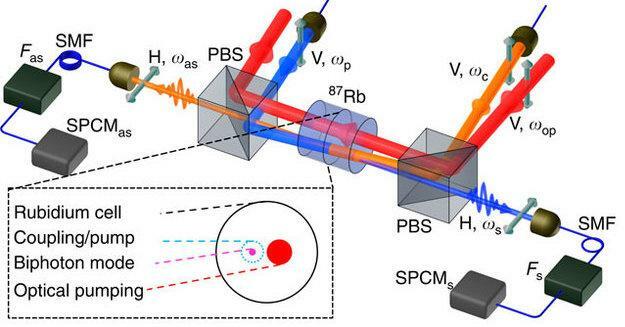 "Subnatural-linewidth biphotons with controllable waveforms have used to be produced from spontaneous four-wave mixing in cold atoms at a temperature of about 10 μK assisted with electromagnetically induced transparency or cavity," said Du. "But such systems require expert knowledge in laser cooling and trapping. A cold-atom apparatus is not only expensive, but also large and complicated in its vacuum-optical-electronic-mechanical configuration. Moreover, operating cold atoms for producing paired photons requires a complex timing control." "In our study, we find a novel way to use a hot paraffin-coated 87Rb vapour cell at 63°C to successfully produce biphotons with controllable bandwidth (1.9-3.2MHz) and coherence time (47-94ns). This is the best result in the world so far for generating narrowband biphotons from a hot vapor cell." Du continued. The two key elements to make narrowband biphoton generation feasible are the paraffin coating and the spatially separated optical pumping. The long ground-state coherence time preserved by the paraffin coating enables efficient optical pumping for the flying atoms, which is spatially separated from the biphoton generation volume. Du said, "Hot atomic vapour cell is simple in configuration, operation and maintenance, and it is a continuous biphoton source. This result may lead towards miniature narrowband biphoton sources for practical quantum applications and engineering."